A base, an arm, a shade; a square, a line, a cone; steel, brass, aluminium; and light. Gira sums up the basic components of a lamp. Based on the study of the traditional flexo, these components have been re-configured in order to endow the lamp with greater flexibility of movement. The shapes lend the light prominence. It is a discrete, versatile lamp: the arm may be rotated and the shade may be positioned to form localised spots of light for working, reading or writing, whether in a room, a hotel lobby or an office. Take a look at it just one time and then try and sketch it from memory. 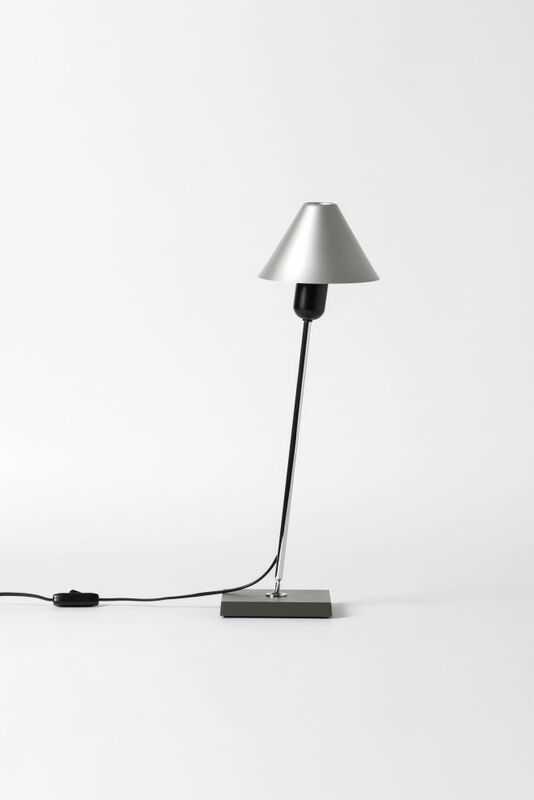 The Gira lamp portrays the simplicity and recognisable profile of a classic. This piece gives an account of the history of design in Barcelona. It was conceived in 1978 by Ferrer, Massana and Tremoleda and was originally produced by Mobles 114, an editing company founded by Massana and Tremoleda. It then achieved international acclaim, featured in a host of exhibitions and received awards all over the globe. However, what genuinely makes Gira stand out from the rest is its function, which places it in a unique category: objects fostering an intimate connection between the user, the light and the environment. Santa & Cole has reedited this classic of Spanish design with a black and natural anodized aluminium shade and featuring a new brass shade.